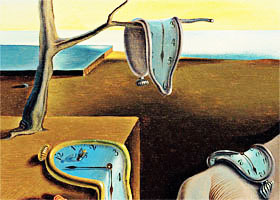 Experiential time is the experience of time, as in "time flies" or "time drags." It is subjective, as opposed to the objective time of the outside world. As they say, "Time flies when you're having fun." The shift from Old Reality consciousness to New Reality, heart-centered consciousness includes a shift in our perception of time. Heart-centered consciousness brings with it an increasing degree of freedom from objective time. It makes life's experiences more important to your consciousness than the passage of time. Life becomes a chain of experiences which seem to expand and contract the time that they take to occur. The objective time continuum is the same, but the perception of the experience is different. As people's frequency of awareness rises up through fourth-density consciousness, they will become more attuned to the synchronicity that is offered by an experiential approach to time. The more people become mentally attuned to others, the more they manifest synchronicity in their lives. Intuition feeds synchronicity, so the experience of time, with its expansions and contractions, takes on more importance than the fixed pace of the outer world's objective time.